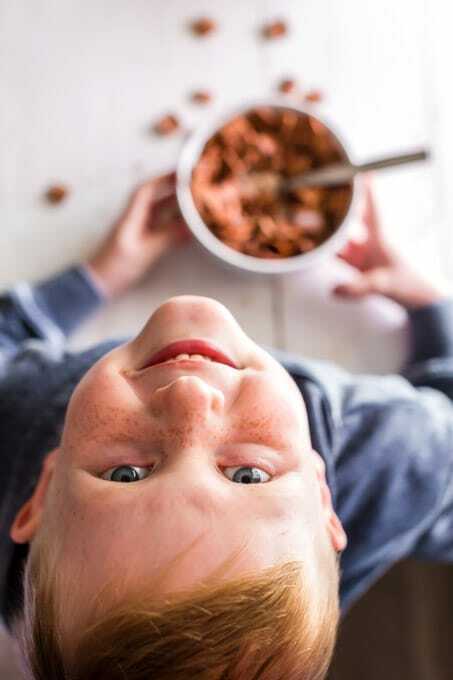 A yummy breakfast, quality family time and an easy chore chart help make our Saturday mornings extra special! 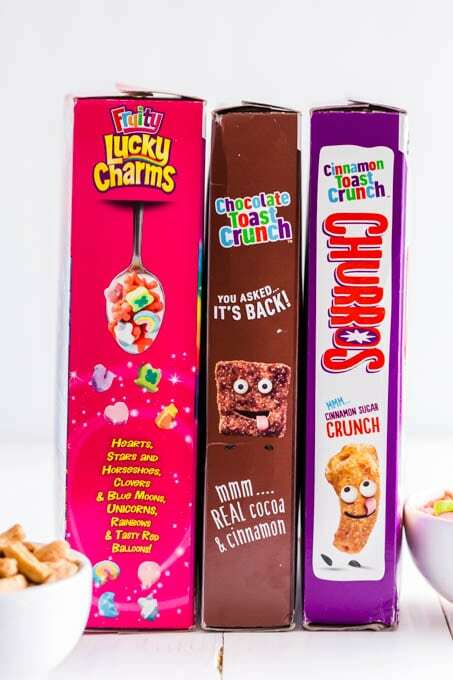 I’m proud to partner with General Mills to bring you these original ideas. It’s January! And we’re back in the full swing of “real life” after a glorious winter break. The first semester of school felt like it lasted approximately 20 years. It’s our first year with both boys in school and it took all of us a minute to adjust to the schedule and routine. I thought winter break would never arrive… and I was oh-so-excited when it finally did! The whole break was magical. We had lots of extra time together as a family. We did fun projects together, saw movies and enjoyed adventures with extended family members. And there were hours of extra sleep that my body is still thanking me for. All the “extras” during the time off have helped energize our whole family for our regular, daily routine now that the holidays are over. Over the break, I did some menu planning and household planning to make sure we got back in a good routine once normal life resumed. It’s helped tremendously! One of the things we started implementing is one of my favorite childhood traditions: Saturday mornings. 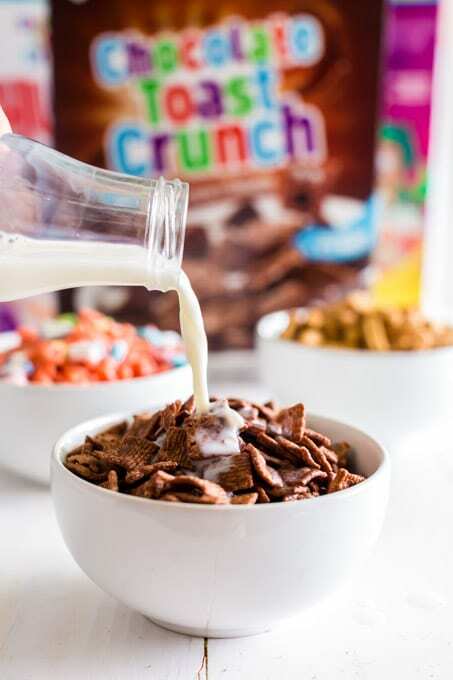 When I was growing up, Saturdays during the school year meant big bowls of cereal while watching cartoons. After breakfast, it was time for chores. 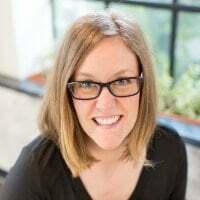 It offered us a chance to kick back and chill with family and then tackle chores around the house in one fell swoop before we got on with the rest of our weekend. 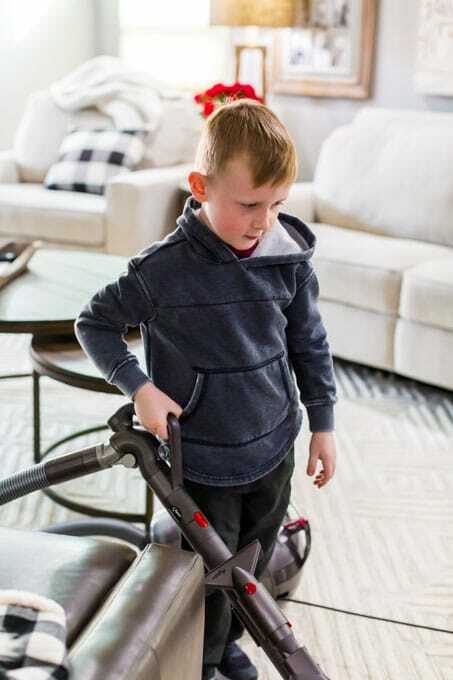 Since the boys are a little older, I’m giving them more responsibilities and teaching them how to handle more chores that are appropriate for their age. Of course, there is often bickering with this. That’s when I decided to create this fun, printable chore chart. The boys are able to spin it to find out what task they’re assigned and then get on with it. I’ll share more on that in a minute. 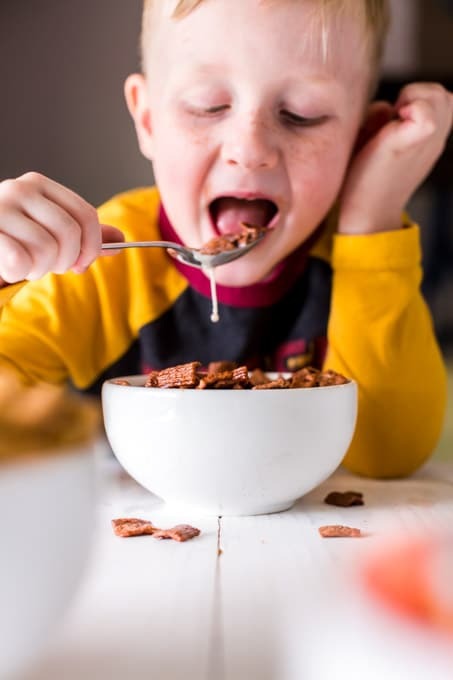 I’ve got to tell you about the new General Mills cereals — there are three new flavors that we are crazy about! They’re showing up in our Saturday morning line up every weekend now. And you’ll be excited to try them too because they’re delicious! 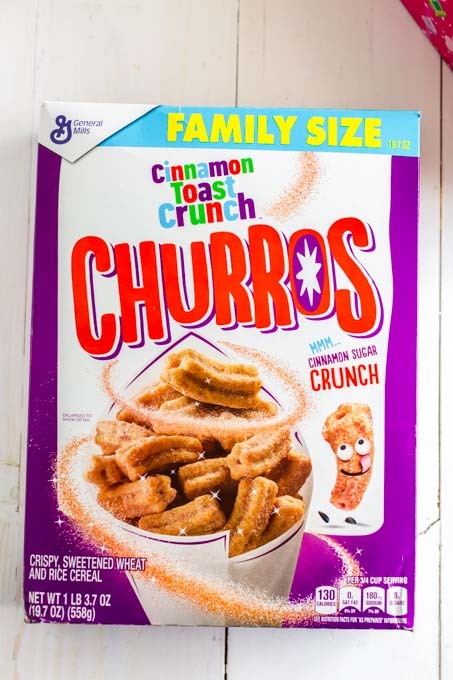 You can head to Walmart to pick them up now: Chocolate Toast Crunch, Cinnamon Toast Crunch Churros, and Fruity Lucky Charms. 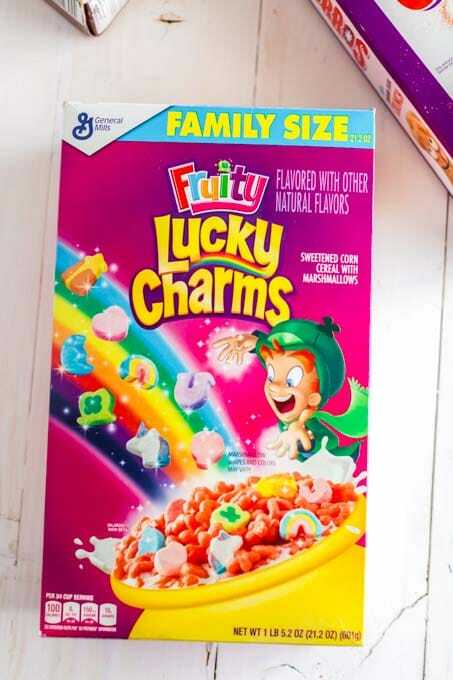 They’re perfect for Saturday morning cartoon watching, but also those busy weekday mornings when I’m working to get everyone ready and out the door on time. 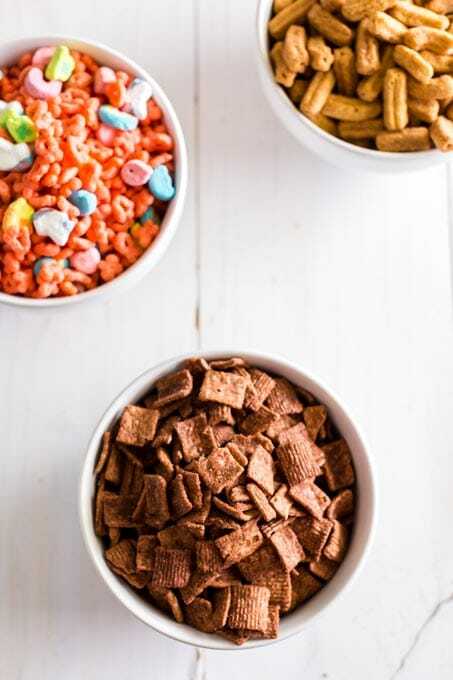 There are no arguments about what’s for breakfast when they get to choose one of these tasty options! After you’ve got full bellies, check out this printable chore chart. I promise it will help end arguments and give mama more peace! White crayon or color pencil, depending on what color foam board you’re using. Start by cutting out the chore chart. Place the chore chart on the foam poster board and trace two circles using the white crayon or colored pencil. 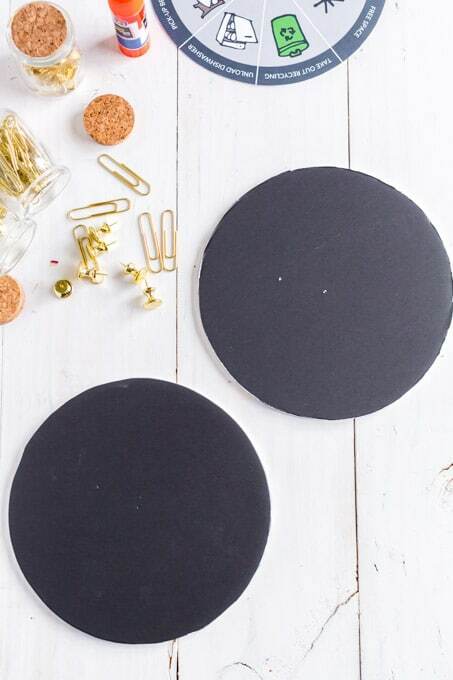 Use the exacto knife (or sharp knife) to cut out the circles. On one side of one circle, generously apply glue. Press the other piece of foam board on top. Next, generously apply glue to the back of the printable and place on top of the foam board. Last, lay the paper clip over the small white circle in the middle of the paper and press the push pin through the middle. Note: I used a large thumb tack and a two-inch paper clip I purchased in a set from a craft store. You can use a smaller pin and paper clip if that’s all you have! The push pin can be a little wobbly, so try placing a little super glue on the tip of the push pin before you push it into the foam poster board. My boys aren’t arguing over who does what chore anymore. After their cereal and cartoons, they’re happy to tackle their job and get on with our day. 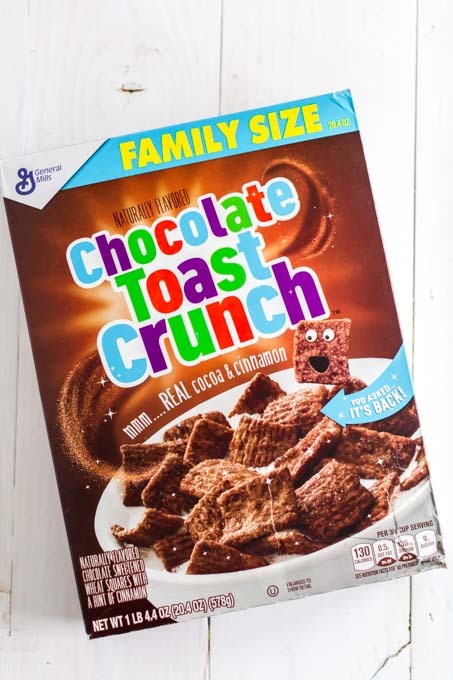 I’m sure your family will love the new General Mills cereals as much as we do. 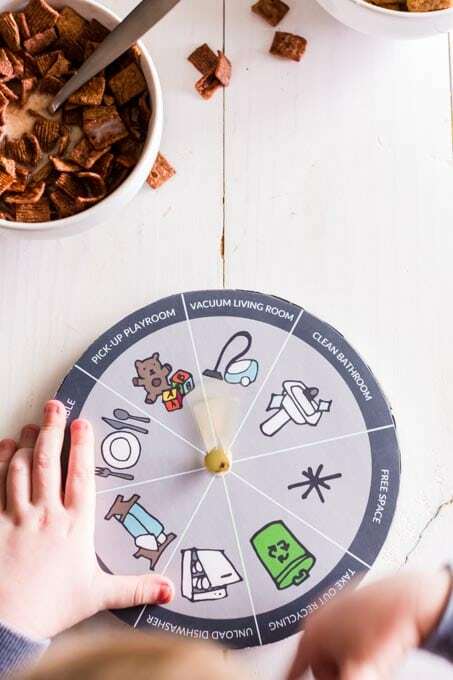 Once you’ve got a full belly, try out our chore chart and have a very happy Saturday!